This product is for the dog who needs a little something extra to tame and soften unruly and unsightly fur. Contains conditioning and moisturizing ingredients such as jojoba oil, vitamin E and aloe vera, as well as a natural lactate that detangles, adds sheen, and softens as it cleans. 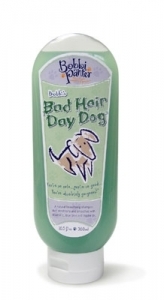 With its appealing pear fragrance, this formula will leave you dog's coat feeling irresistibly silky! Ingredients: Deionized Water, Ammonium Lauryl Sulfate, Cocamidopropyl Hydroxysultaine (and) Aqua, Cocoamidopropyl Betaine, Isostearamidopropyl Morpholine Lactate, PEG-150 Pentaerythrityl Tetrastearate (and) PEG-6 Caprylic/Capric Glycerides (and) Water, Hydrolyzed Oat Protein, Glycerine, Lavender Extract, Aloe Vera Gel, Jojoba Oil, Tocopheryl Acetate, Rosemary Extract—conditions and adds sheen, Chamomile Extract. A small amount of preservative is required to protect our natural ingredients. Dilution: 16-1.